He taught me more about respect than anyone I can think of. – Thabiti Anyabwile, speaking of his brother, Victor. Ron Burns chose the name for himself, Thabiti Anyabwile, because of his black nationalist identity. Today, he still goes by that name, and is a contributor to evangelical organizations like 9 Marks, Desiring God, and the Gospel Coalition. Anyabwile has risen eyebrows for some time, repeatedly choosing to presume the police guilty in cases like those in Ferguson and Baltimore and showing one-sided support to the anti-police and criminal contingent in this national debate. Anyabwile has tweeted that he “stands with” and “supports” the organization that is considered by many to be Marxist, racist, anti-cop and pro-LGBTQ, Black Lives Matter (source). Thabiti first seemed to have endorsed Bernie Sanders on the grounds he was the best candidate for blacks (source), and when questioned about Sanders’ support of abortion, he suggested that the unborn aren’t “living” (source). Thabiti, who denied that he endorsed Sanders because he would never endorse a candidate (source) then went on to officially endorse Hillary Clinton on the same grounds that he favored Sanders (source). Anyabwile has repeatedly agitated for Black Lives Matter, retweeting inflammatory and presumptive assertions with a definitive anti-cop vibe (source). He has repeatedly attacked law enforcement, judges and grand juries for their fact-based findings in relation to Ferguson and other due-process matters (source). Anyabwile went so far as to defend the Black Panthers in social media in light of the Dallas police massacre (source). In short, Anyabwile’s posture towards police officers has been combative. Anyabwile has not mentioned publicly (so far as Polemics Report can tell) that a possible reason for his antipathy and dislike of police officers is that his own brother was arrested for assault and for a kicking, shoving, knife-wielding resistance of the police. Being non-biased in his judgment toward police may be hard for Anyabwile, given his family’s anti-police criminal history. A 1985 article from the Lexington newspaper indicates that a “Victor Lamarr Burns” was to appear in court on August 27 of that year, having been arrested on two counts of assault on a female (a relative) and resisting arrest (source). With a butcher knife in hand and with a bleeding relative nearby, a police officer – Tim Robertson – placed Burns under arrest and the subject then kicked him and pushed him. Officer Robertson had to pull his service revolver when Burns refused to drop the knife. Please note; Robertson did not shoot the armed assailant. 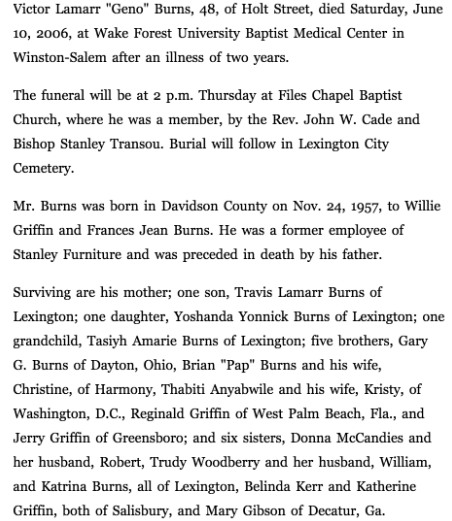 Victor Lamarr Burns’ obituary lists his brother as Thabiti Anyabwile (source). The birth year in the obituary matches the age of the suspect and assailant in the 1985 newspaper article. The location is the same approximate geographical area. A sister mentioned in the obituary, Trudy, was also mentioned in the court paperwork from the courthouse archives stemming from the assault and resisting arrest charges in 1985. Polemics Report reached out to the Davidson County Clerk of Court and had the documents pulled from the archives by employee, Jo Black. According to Black, Burns was charged with assault of a deadly weapon and resisting arrest, verifying the validity of the newspaper article. However, the article did not state whether or not Burns was convicted. Black was able to substantiate that Burns plead guilty to both counts and was convicted of both counts. He received 30 days active sentence with 24 months deferred. Thabiti, writing of ‘Geno’ (his brother, Victor) for the Gospel Coalition said, ” He taught me more about respect than anyone I can think of” (source). If there were two ‘Victor Lamarr Burns’ in the same community, born the same year, with relatives of the same name, and this is a case of mistaken identity, this article will be amended. Three separate requests for on-the-record comment were made to Anyabwile via email over the course of the last week, with no response. Is it possible that Anyabwile’s dislike, distrust, and disrespect of the police are deeply ingrained? Does he find assault and resisting arrest to be justifiable? Is this the type of “respect” Anyabwile was taught to have for the police? Should the fact that Officer Tim Robertson did not shoot his brother when he was kicking him with a knife in hand not lead him to a slight degree of appreciation for police restraint? Podcast: Evangelicals Boycott Beth Moore? Previous story Pokemon: Cuz The Church Needs To Be Relevant, Right?